Product prices and availability are accurate as of 2019-04-19 18:47:52 UTC and are subject to change. Any price and availability information displayed on http://www.amazon.com/ at the time of purchase will apply to the purchase of this product. 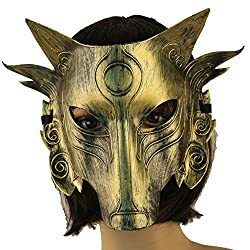 Full face wolf mask for couples cosplay,masquerade,looks unique and cool. Wolf mask size about: 10.6*7.1 inch,with elastic band,fits most women and men. Costume wolf mask made of PVC,lightweight,most people's choice for cosplay party. Wolf mask perfect for Masquerade Ball, Mardi Gras,Halloween,Costume,Cosplay Party. 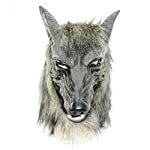 We guarantee 30 days money back if you are not satisfied with the costume wolf mask.